Traditional twin exposed shower valves are a great upgrade for your bathroom and are made to the highest standards, perfect for a classic bathroom looking for a style boost. 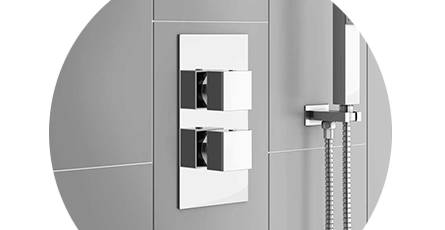 Our twin concealed thermostatic shower valves are a fantastic choice for a minimalist bathroom style. Enjoy a crisp, ultra-modern look with the added safety feature thermostatic shower valves offer. Our wide range of twin shower valves includes designs from top industry brands such as Heritage and Hudson Reed so you can buy in the knowledge that you're getting quality.